The Sweden Palaces ... marble installation systems by Mapei. 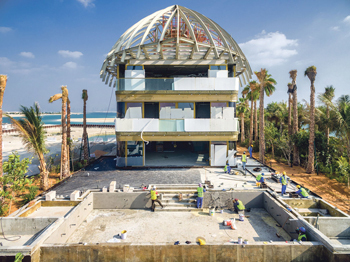 Products from Mapei, a leading manufacturer of adhesives, sealants and chemical products for the building industry, were chosen to provide lasting protection for the palaces on Sweden Island at the prestigious The World project in Dubai, the UAE. Sweden Island will be home to 10 exclusive waterfront villas designed to mirror Swedish viking vessels, each enjoying seven bedrooms resembling the upturned hull of a ship, an exterior pool deck and a private beach. Mapei was selected as the preferred supplier for the project by Kafesha Industrial, one of the region’s largest suppliers of stones, after the latter was awarded the marble installation job of the Sweden Palaces. The Italy-headquartered firm already enjoys a good relationship with both the installer and the team of designers for The Heart of Europe, with whom it has worked with closely. 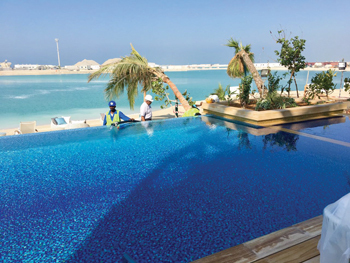 Mapei was selected for the project based on its wide selection of waterproofing products that were perfectly suited for a project surrounded by water, according to a spokesman for the company. It worked on the first two mock-up palaces on Sweden Island, including key interior areas, such as the lobby/entrance, living rooms, dining rooms and bathrooms; and exterior areas including pool and pool deck. According to the spokesman, the project’s biggest challenge was building structures that could withstand the island’s weather conditions. Mapei solutions ... for key interior areas. He elaborates: “It was imperative that products used in the construction of these palaces were resistant to the harsh climatic conditions, tidal pressures, and most importantly, were impervious to salt water. Ultraplan Eco was applied throughout the project’s interior. The self-levelling compound gave the flooring high resistance to traffic, ensuring a smooth and level finish that would not cause damage to the flooring materials. Following the self-levelling application, parquet flooring was installed using Ultrabond P990 1K. 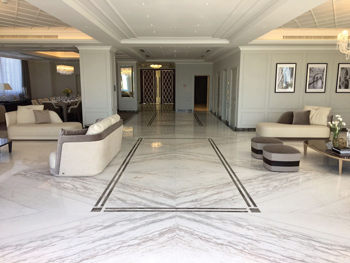 White natural stones were installed for the lobby and living room floor. The slabs, cut to size, were bonded to the base using Keraflex Maxi S1, an improved slip-resistant cementitious adhesive. This adhesive was also used in the palaces’ bathrooms to install book-matched stone. Kerapoxy was used in internal and external grouting of ceramic and mosaic floor finishes. Mapelastic AquaDefense – a ready-to-use, ultra-quick-drying, flexible liquid membrane for waterproofing internal and external surfaces – was selected for waterproofing the bathrooms. Furthermore, Ultracolor Plus, a high-performance, quick-setting polymer-modified mortar, known for its water-repellent and DropEffect characteristics, was used for grouting the marble tiles. For the outdoor areas, sandstone was selected as the floor finish of the pool deck and Keraflex Maxi S1 was used to adhere the stones. Mapelastic Smart, a two-component, high-flexible cementitious mortar, was selected for the pool waterproofing works while Kerapoxy Design and MapeGlitter were used to install the glass mosaic tiles. The Heart of Europe is a cluster of islands representing the European continent within The World, which is made up of more than 300 islands forming the shape of the world map. Mapelastic Smart mortar was chosen for pool waterproofing works. Located 4 km off the coast of Dubai, the Heart of Europe includes six island clusters portraying trademark cultural characteristics from Germany, Monaco, Sweden, Switzerland, St Petersburg, and Main Europe island – each of which boast a unique design. Overall, the project will hold a variety of developments, including 20 private villas, six apartment complexes, six hotels, six lighthouses, six seahorse villas (underwater), several restaurants and retail shops. Kleindienst Group, the developer, owner and consultant of The Heart of Europe, has launched the project’s second phase and intends to complete it before Expo 2020 Dubai, a world-class event that opens in October 2020. The landmark will boast some of the construction industry’s most innovative solutions, integrating sustainability and green technology into its state-of-the-art facilities. Sweden Island, incorporating the country’s authentic architecture, will be home to 10 distinguished waterfront villas. The island will also incorporate authentic Swedish-themed celebrations, cultural events and festivals to provide a genuine tropical destination.